KVAP™, the Kalsi Valve & Actuator Program, is state-of-the-art software that efficiently performs reliable design basis calculations for all common types of globe, gate, diaphragm, butterfly, ball, and plug valves as well as linear and quarter-turn actuators used in AOV and MOV applications. A number of utilities, while implementing their AOV/MOV programs, found that the industry was lacking validated models for predicting performance of many types of valves used in safety-related applications. To address this major generic industry-wide need, Kalsi Engineering, Inc. initiated a comprehensive flow loop testing program which led to the development of improved and validated methodologies that accurately predict torque requirements for all types of quarter-turn valves prevalent in AOV/MOV applications. The KVAP software and its extensive database capabilities incorporate the new validated models for quarter-turn valves developed under this program. KVAP also includes industry-established models for all other common types of globe, gate, and diaphragm valves and actuators to offer a complete software package for AOV and MOV calculations. All testing, analytical model development, software development, and verification and validation activities were performed under the Kalsi Engineering, Inc. quality assurance program, which meets 10CFR50 Appendix B requirements. The improved models in KVAP represent a significant advancement in the valve prediction methodologies, which can eliminate unnecessary equipment modification and provide an alternative to expensive dynamic testing as a means of demonstrating valve operability. KVAP was developed by Kalsi Engineering, Inc., which is recognized as the leader in the industry to support utilities in their AOV, MOV, and check valve programs. The Kalsi Valve & Actuator Program is state-of-the-art software that efficiently performs reliable design basis calculations for all common types of globe, gate, diaphragm, butterfly, ball, and plug valves as well as linear and quarter-turn actuators used in AOV and MOV applications. KVAP is the only AOV/MOV software in the industry that includes a number of new validated models based on first principles supported by extensive CFD analyses and 10CFR50 Appendix B testing. These new models are applicable to several types of valves that are common to AOV/MOV applications which had not been addressed by the EPRI MOV PPM, JOG AOV, NSSS Owners Groups, valve manufacturers, or other organizations marketing competing software. KVAP includes a comprehensive database of 10CFR50 Appendix B test results to accurately predict torque/thrust requirements for various types of valves under design basis conditions. The flow loop test matrix to support KVAP development and validation included over 2,000 static and dynamic tests to cover variations in valve/disc geometry, elbow orientation, elbow distance, fluid type, flow direction, flow rates, and maximum DP. KVAP provides geometry-specific torque and flow coefficients for baseline conditions and for elbow effects. In many applications, the new KVAP models for quarter-turn valves provide a substantial increase in margin between valve requirements and actuator capabilities, thus eliminating unnecessary equipment modifications. The KVAP database and the more accurate models have already demonstrated substantial cost savings for the plants. From inception, KVAP software development was planned with a well-structured modular approach to minimize the cost and time associated with the V&V effort for upgrades and revisions. This ensures that new data and improvements to address emerging industry issues for AOVs and MOVs can be efficiently incorporated, verified, and validated in KVAP. 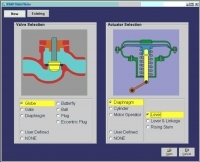 The KVAP software input and output screens are heavily supported by graphics that illustrate critical features and dimensions of the valve being analyzed, valve orientation, flow direction, elbow orientation, required valve thrust/torque throughout the stroke, minimum and maximum actuator capability throughout the stroke, and margin throughout the stroke. This user-friendly graphic interface eliminates mistakes and errors commonly made during AOV calculations. KVAP was developed by a team of Kalsi senior specialists who are recognized as leaders in the industry for technological advances in AOVs, MOVs, and check valves. Our specialists have more than 20 years of continuous involvement in R&D to develop validated first principles models and software for valves and actuators to address generic industry-wide issues, including the EPRI MOV Performance Prediction Program and MOV guides. This experience is supplemented by performing design basis calculations and implementing AOV, MOV, and Check Valve programs at more than 30 power plants. KVAP software is capable of evaluating the following types of valves and actuators used in AOVs and MOVs. These cover all common types of AOVs used in the U.S. nuclear power plants. The price for each option depends upon the number of licenses purchased by the utility. For specific cost information for your need, please contact Dr. M.S. Kalsi or Neal Estep at 281-240-6500.